Dhaka, 20 Feb, Abnews: We know rose water's great for skin and hair but why it's good and how exactly must you use it, is key! Here are10 amazing skincare and hair care uses of rose water you'll thank us for. Wondering why rose water has found a place in every Indian household? It's simple. Rose water is undoubtedly beauty's magic potion, and remarkably versatile. Whether you have oily, dry or combination skin, rose water can be added to your beauty regime. That's what makes it a beauty secret or rather a secret weapon of women all over the world, not just India. While purchasing rose water, you must make sure you buy only 100% pure rose water i.e. the distilled water of roses sans the chemicals, the by-product of rose oil production. The usage of rosewater dates back to early Egypt, when Cleopatra (yes, Cleopatra) used the natural product in her skincare regime. And how can we not follow the footsteps of the world's most legendary beauty queen? 1. Rosewater helps maintain the skin's pH balance, and also controls excess oil. 2. "Rose water has anti-inflammatory properties that can help reduce the redness of irritated skin, get rid of acne, dermatitis and eczema. It is a great cleanser and aids in removing oil and dirt accumulated in clogged pores", says Dr. Deepali Bhardwaj, Skincare Expert. 3. Rose water helps hydrate, revitalise and moisturise the skin giving it with that refreshed look. 8. The nourishing and moisturising properties of rose water enhance the quality of hair. It is known to treat mild scalp inflammations and get rid of dandruff. Rosewater works wonders as a natural conditioner and revitaliseshair growth. 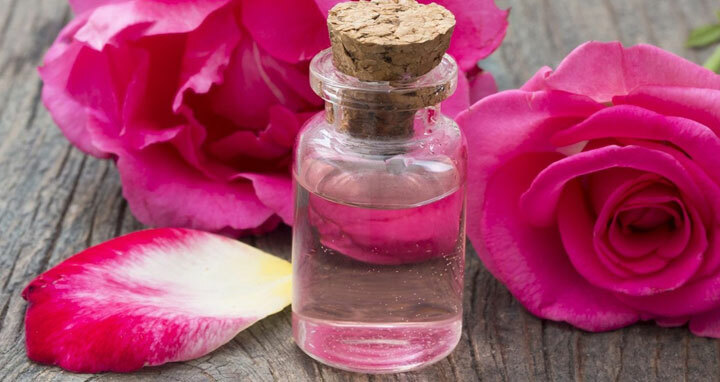 The best and easiest way to use rose water maybe to apply it at night, to clear all impurities the face has collected through the day; but we've listed other surprising uses which are so quick and easy, you'll be shocked. 1. Spritz Away! "A great way to use rosewater is by spritzing it on your face. Rosewater can also be sprayed over makeup to work as a makeup setting product, the mist will leave your face radiant", suggests Delhi-based makeup artist, Mrignaina Kumar. Fill an empty spray bottle with rosewater and spritz once you're done with your morning beauty routine to keep your face fresh and hydrated. 4. No More Tired Eyes: If you have tired, inflamed eyes - soak a cotton pad in chilled rose water and apply. It helps reduce puffiness under the eyes and get rid of redness. 5. Hair Conditioner: Post shampooing, use a cup of rose water as a final rinse. It helps condition the hair deeply, adding a healthy shine you'll just love. 7. Goodbye Acne: "Mix 1 tbsp of lemon juice with 1 tbsp rose water, apply it on acneic skin and let it stay for 30 minutes. Wash with fresh water and reap the benefits", says Dr. Rahul Nagar, Dermatologist, Max Hospitals. You can also apply a speedy facepack of fuller's earth (multani mitti) and mix it with rose water. Once it dries, wash it off. This helps cleanse pores, control excess oil and prevent acne.